Augmented reality is a digital layer superimposed on the physical world. Augmented reality applications are developed on special 3D programs that enable developers to integrate contextual or digital content with the real world. Moreover, it integrates the real-life environment with virtual details that enhance the experience. This is typically achieved by looking at real-life environments through a smart goggles and headsets, smartphone or tablet screen. Augmented reality in automotive is majorly used for the application that displays the features of pedestrian, navigations, and smart signaling on a windshield. Virtual reality uses head mounted display of goggles for the creation of an interactive & completely digital environment that provides a fully enclosed synthetic experience, and visual feedback. In addition, virtual reality in automotive is a three-dimensional (3D) computer generated environment, which takes the end users to an artificial world. Technological advancement in connectivity primarily drive the growth of the market. 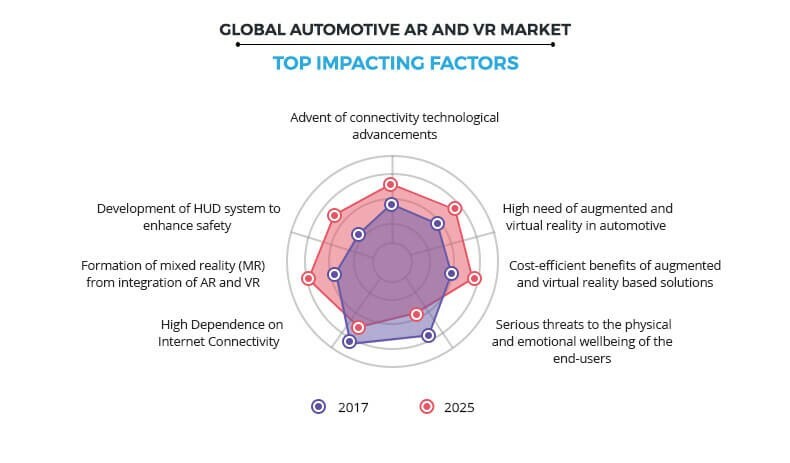 In addition, increase in need of augmented and virtual reality in automotive and cost effective benefits from the AR and VR based solutions are responsible for the growth of the market. However, the serious threats to the physical and emotional wellbeing of the end-users and high dependence on internet connectivity are anticipated to hamper the growth of the AR and VR market. Furthermore, formation of mixed reality (MR) from integration of AR and VR and the development of HUD system to enhance safety ensures emerging growth opportunities for this market. This is expected to boost the growth of the market in near future. The key players operating in the Automotive Ar And Vr Market include Continental, Microsoft, Visteon Corporation, Volkswagen, Unity, Bosch, DAQRI, HTC, Hyundai Motor, and Wayray. The rise in penetration of Internet of Things (IoT) in automotive supports faster connectivity for more intuitive visualization and interaction. Also, many companies are developing smart AR glasses with a Qualcomm collaboration that features the multimode connectivity (4G, 5G), eye tracking cameras, and optics & projection technology within semitransparent display. There is an increase in the demand for 5G networks in automotive as it enables high speed data transfer with lower latency and improves traffic capacity & network efficiency. Moreover, these 4G and 5G networks are expected to enable VR devices to offload computational work besides increasing the fidelity of VR experiences. Thus, such application based technological advancements in automotive boost the growth of the automotive AR and VR market. In the past, augmented and virtual reality has gained huge popularity and adoption among various end-user industries, such as digital manufacturing, media & entertainment, education, healthcare, defense & security, and civil aviation. Nowadays, end-user organizations are inclined toward deploying augmented and virtual reality based solutions in automotive field for design & assembly and repair & maintenance. Moreover, this technology helps assist designers in visualizing the body structure of a vehicle, as to improve efficiency, safety, and durability. Furthermore, safety at assembly line is increased by tracking human movement to decrease the risk of injury. In addition, augmented reality helps manufacturers with the overall design process. The AR and VR technology assists designers in visualizing the body structure of a vehicle to improve efficiency, safety, and durability. Many key players in the automotive industry implement the AR and VR systems in their vehicles. For instance, continentals has started offering AR-HUD unit that includes sensors, cameras, and GPS and supports all high-end features with the base of AR and VR. Thus, such high demand of AR and VR in automotive fuels the growth of the automotive AR and VR market. People using virtual reality have faced eye strain, headaches, and in some cases, nausea. Various experts in AR and VR also said that it is due to the way VR affects the eye-brain connection. Furthermore, a certain percentage of users have experienced motion sickness, anxiety, and severe eyestrain after using VR headsets for a prolonged period. The AR and VR technology disconnects the users from the real environment. This results in retinal radiation, which may be a potential cause for eye cancer. Such drastic causes of AR and VR units if not addressed properly act as an inhibitor and affect the adoption rate of virtual reality or augmented reality technologies. Thus, health concerns restrain the growth of the automotive augmented reality and virtual reality market. There is an increase in the number of applications in automotive specially related to infotainment and cockpits control system. These applications do not run on slow internet connectivity. Moreover, indications of traffic, lane detection, and other features need improved internet connection. In addition, under developed countries, especially Africa, are unable to adopt augmented and virtual reality technology owing to lack of infrastructure support for fast internet connection. Also, some countries such as Eritrea, Burundi, Chad, Somalia, and others, have low penetration of internet. Therefore, this high dependency on internet hampers the growth of the automotive AR and VR market globally. Formation of mixed reality (MR) from integration of AR and VR offers immense growth opportunities to players in the automotive augmented reality and virtual reality market. Holographic projections and interactive virtual display garner increased focus in automotive field. In addition, MR allows engineers to wear special headsets through which they can view the holographic image of the engine, and with various image and voice features can understand the engine in-depth and make changes accordingly. Such simulation based leaning is expected to create an opportunity for the growth of the automotive AR and VR market in future. Augmented and virtual reality technology is currently being used to supplement safety features in vehicles. Furthermore, in May 2017, Continental introduced a prototype AR-HUD system for assisting drivers that works by displaying actionable data and images on the vehicle's windshield. The AR and VR technology is used in automotive to support the features such as turn-by-turn route navigation, safety distance monitoring, lane-departure warning (LDW), and adaptive cruise control (ACC). Moreover, in application, the driver can see blinking arrows when the system senses an upcoming turn during navigation with an interactive image. Thus, the innovations in development of HUD system to enhance safety in automotive applications boosts the growth of the automotive AR and VR market. 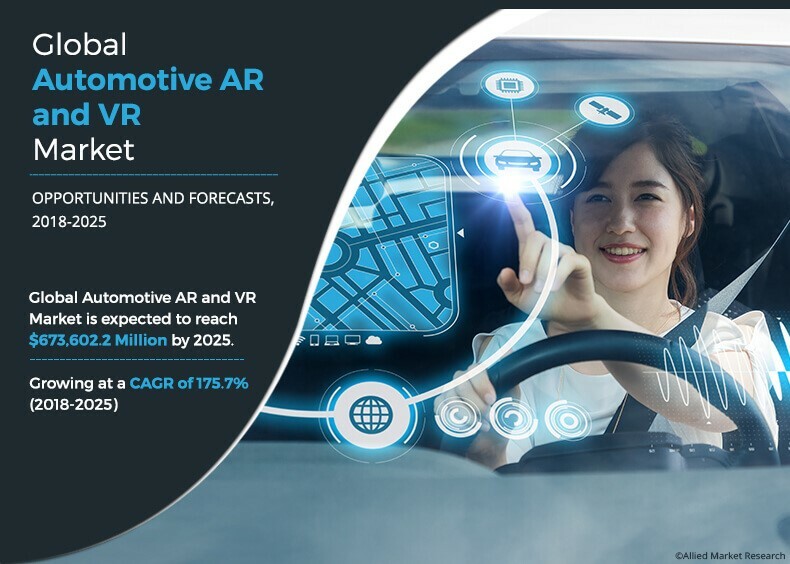 This study presents analytical depiction of the automotive AR and VR market analysis along with the current trends and future estimations to depict the imminent investment pockets. The report presents information related to the key drivers, restraints, and opportunities of the market with a detailed impact analysis. Augmented and virtual reality is used in automotive to increase productivity, efficiency, and safety in operation. Furthermore, it saves time and creates a flawless output by reducing complexity. The applications of automotive AR and VR include digital instructions for assembly & training, visualization of historical maintenance records, reference videos, equipment design and digital manuals, and provision of task recommendations. Technological advancements in connectivity modules primarily drive the growth of the market. 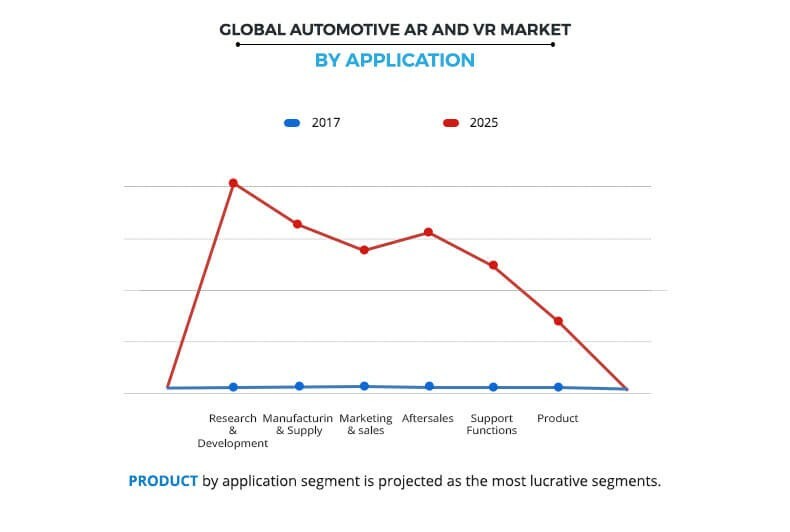 In addition, increase in need of augmented and virtual reality in automotive and cost effective benefits from the AR and VR based solutions fuel the growth of this market. However, the serious threats to the physical and emotional wellbeing of the end users and high dependence on internet connectivity are anticipated to hamper the growth of the AR and VR market. Furthermore, formation of mixed reality (MR) from integration of AR and VR and development of HUD system to enhance safety ensures emerging opportunities, thus boosting the market growth in the upcoming years. Among the analyzed geographical regions, currently, North America is the highest revenue contributor and is expected to dominate during the forecast period, followed by Asia-Pacific, Europe, and LAMEA. This growth is attributed to the increase in demand for automotive sector for various types of vehicles. "Automotive AR and VR Market"